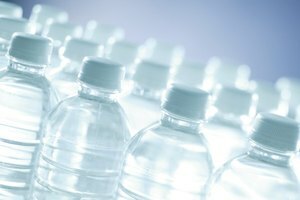 The three most common materials from which drink containers are constructed are glass, foam and plastic. When choosing which type to use, one consideration is which keeps hot drinks hot and cold drinks cold. Glass, foam and plastic have very different insulating properties. Foam drinking containers are made of expanded polystyrene (EPS), a form of polystyrene plastic filled with tiny air bubbles. Plastic drink containers, such as soda bottles, are commonly made of Polyethylene Terephthalate Polyester (PET). 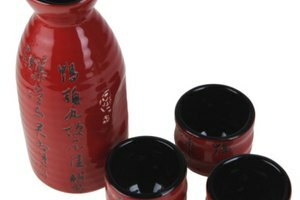 The glass used for drink containers is made of recycled glass, high-purity silica sand, sodium carbonate and various chemical salts to purify and strengthen the material. 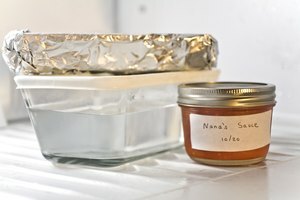 Liquids become warmer or cooler because energy migrates from hot to cold. If the drink is warmer than the room, for example, the heat energy will travel from the drink to the cooler air, resulting with the liquid cooling. Conversely, if the drink is cooler than the room, the heat energy from the warmer air will travel into the drink, warming it. The rate of the heat transfer depends on the insulating properties of the container. When it comes to retaining heat, glass is inferior to plastic and Styrofoam in terms of insulation. The thermal conductivity for each, as measured in BTU / (feet - hour - degrees F) is 1.82 for glass, 0.09 for paper, 0.06 for Styrofoam. The conductivity of plastics varies depending on the specific materialized used, which in plastics can vary. Hard plastic, either polystyrene or polycarbonate, have higher insulative values than glass and are tougher and thicker than Styrofoam cups. This not only improves the insulative ability of plastic mugs, but also makes them a safer choice in terms of driving with scalding hot drinks. 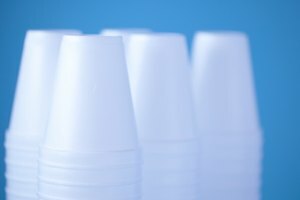 While Styrofoam is a quality insulator, it is not widely used by many because it is not environmentally friendly, while re-useable plastic containers are eco-conscious.